Between May and October 1969, The Velvet Underground went many times at Record Plant Studio in NYC with engineer Gary Kellgren and amassed a number of tracks for a fourth Verve/MGM album, an album that was never released, even if a catalog number was reserved by MGM: SE-4641. These songs began to turn up in rough form on bootlegs in the mid-seventies, and were finally presented officially in remastered form in the mid-eighties on the collections of previously unreleased recordings VU and Another View. Five tracks - re-remastered and with some extra time - were also reissued in the 1995 Peel Slowly And See 5-CD box set. 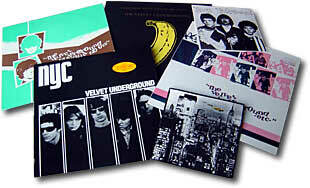 The 14 cuts splitted between the two outtakes compilations, "The Great Lost Velvet Underground Album" remains actually unreleased. However it can be restored by extracting and compiling the tracks from the various sources which offers material from the 1969 MGM studio sessions. You will find below the guidelines to two different editions. The first one 'Hi-Fi' is made from the remastered tracks released on the official records. The second one 'Lo-Fi' - for diehards only - is made of the original rough mixes from various bootleg releases. The 14 tracks are presented chronologically and the source indicated is the best one available. Audio software is needed to normalize the tracks from VU and Another View to make them sound as loud as the Peel Slowly And See ones. Perfectionists will have to pick up the introductory coda to Foggy Notion that appears only on the vinyl version of the VU album. The sources indicated are in my opinion the best available - you can find those tracks on some other bootlegs but usually with inferior sound quality - eg Orange Disaster. Speed correction is needed using the officially released tracks as reference. The completist will restored the introductory coda to Foggy Notion which is only available on the old famous 22 demos tape. I Can't Stand It, Real Good Time Together and Lisa Says haven't surfaced in their rough mix form. 1 Foggy Notion May 6, 1969 6:40 22 demos + White Heat or Etc. 3 I'm Sticking With You May 13, 1969 2:09 White Heat or Etc.